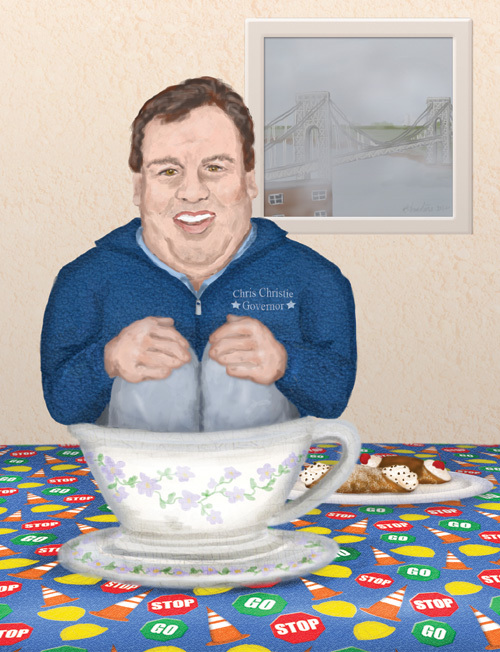 Is Chris Christie’s bridge closing scandal just a tempest in a teacup or more of a Category 5 hurricane for the Governor of New Jersey’s political career and presidential aspirations? With the annoyance of Hurricane Isaac fading behind them, Republicans from far and wide are converging on Tampa, Florida to rally for their candidates and champion their proposed agenda for the country. In order to draw attention to President Obama’s divisive policies, party strategists decided to revive the “E Pluribus Unum” motto to underscore the party’s commitment to diversity while at the same bringing all factions of the country together to strive towards a common goal of jobs and prosperity. “Out of many, one?” –Rep. Ryan immediately seized upon the expression clamoring “That’s just how sausage is made!” As an avid hunter and a member of Congress, Rep. Ryan is no stranger to the intricacies of making sausages. In his home state of Wisconsin, his prowess in making kielbasa is undisputed among fellow Cheeseheads. Furthermore, since Rep. Ryan was once a salesman for Oscar Mayer in Minnesota, he has valuable experience with selling the sausage concept without disclosing too many details as to what went into its making, thus putting him in a strong position to articulate the Republican message on the convention floor. In a moment of inspiration, Rep. Ryan suggested to his running mate that they rent the Weinermobile to ride into Tampa in a parade that will signal the official beginning of the Republican National Convention. Gov. 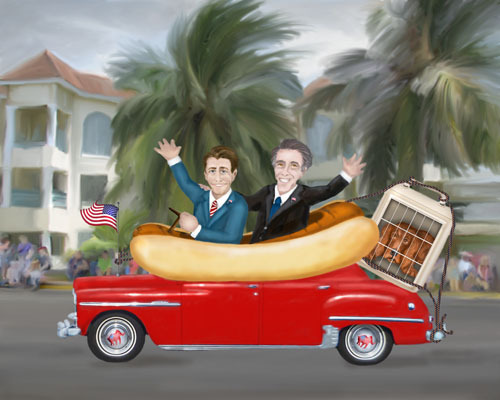 Romney concurred that the imagery of a giant sausage coursing the streets of Tampa would give the campaign a boost and energize their supporters. There was a problem, though. Among their many campaign themes was “Build America by buying American” and this gave rise to some concerns regarding potential criticism associated with riding in a vehicle built on an Isuzu chassis manufactured overseas in Japan, Gov. Romney decided against using the official Weinermobile, this in spite of his Rep. Ryan’s proficiency in its operation acquired during his college years. So, in order to demonstrate their unshakable commitment to financial austerity and responsible spending, the duo agreed to build a custom vehicle using a vintage 1950 Plymouth Special Deluxe 4 Door Sedan that Gov. Romney found in an abandoned barn in western Massachusetts. The two did it all by themselves in their spare time, and without government help. Seamus reluctantly agreed to accompany his owner on the jaunt in order to refute allegations of abuse and demonstrate for once and for all that he enjoys riding in a kennel on top of a vehicle. This cooperation was predicated on an understanding that he would be rewarded afterwards with one of Rep. Ryan’s tasty homemade kielbasa sausages. The principle of lower taxes is going to be met with universal acclaim. Nevertheless, the two candidates face numerous daunting obstacles in selling their programs to the electorate, such as widespread public skepticism regarding the viability of devolving Medicaid to the states in the form of block grants that would be conveyed to insolvent spendthrift states like California, Illinois, Michigan, Nevada and New Jersey. What’s more, Rep Ryan’s bold plan for privatizing Medicare has many older Americans wondering if they are going to be on the receiving end of the sausage. Shortly thereafter, in January 2009, he was impeached by the Illinois House of Representatives and subsequently by the Illinois State Senate. In April 2009 he was indicted by a federal grand jury and in August 2010 he was convicted of lying to the FBI, which was only one of the 24 charges he faced, the jury having been hung on the other 23 counts. The prosecution immediately announced that they would seek a retrial on these counts. The governor repeatedly sought to have the charges dismissed and the trial halted. Defense counsel argued that the case had received such extensive publicity that all of the potential jurors on planet Earth had already been tainted by the many news stories that portrayed Blagojevich unfairly and published inaccurate characterizations of his actions. Taking into account the governor’s statement about being on the wrong planet and anticipating an unfavorable verdict from a hopelessly biased jury, the defense attorneys requested a change of venue to another planet outside of our solar system. U.S. District Judge James Zagel obliged and agreed to move the trial to Gliese 581d, an earthlike exoplanet located about 20 light years from Earth. In response to the court’s request, friendly aliens from the underground extraterrestrial base in Dulce, New Mexico promptly dispatched a saucer to transport the governor and his defense team to Gliese 581d, a planet they know as Zugzigvy. The jurors were dismissed and Blagojevich was promptly ushered into a disc under the cover of darkness. The craft departed and entered into a wormhole just behind the moon and arrived at Zugzigvy so quickly that the governor did not even have time to arrange his hair. As soon as he landed, the Governor was arraigned before a Zugzivian Imperial Anti-Corruption Magistrate. Unfortunately for the governor, the Zugzivian people have no tolerance for corruption and misconduct on the part of their elected officials. Their society is much more advanced than our own and has long evolved past the primitive state whereby elected officials abuse their positions with impunity and betray the trust of their constituents. Corruption is viewed as a very serious crime and the governor’s bench trial lasted less than an hour before he was pronounced guilty on all 23 counts. Zugzivians do not routinely imprison criminals as this is viewed as a waste of public resources. Instead, they mandate various forms of community service that are designed to rehabilitate the offender while at the same time contributing to the advancement of science and medicine. 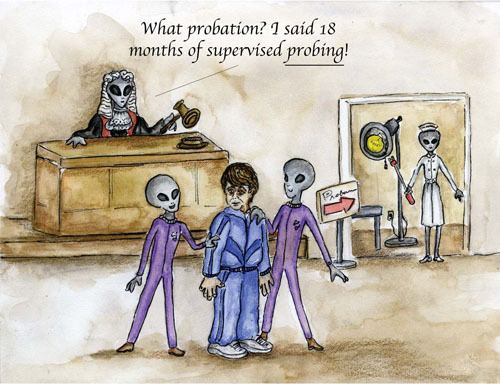 Science fiction fans will be familiar with the accounts of alien abductees who assert that they were the objects of invasive and humiliating medical examinations on the part of their extraterrestrial captors. The governor will be no exception, and Nurse Gszkwy stands ready with her multipurpose probing instrument in anticipation of his arrival.